Jwon (Dialectx Crew), DJ Thumbprint (Kids Of Soul), and DJ Norm Rocwell (Dialectx Crew/Kids Of Soul) team up to bring their slept-on efforts into the project collectively known as Jeshno. 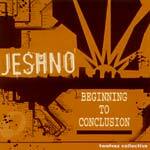 Backed by vocal stylings of Denise G., Jeshno will infect ears around the world. The first of many releases from the Twelvez Collective. All Production by Jwon. All cuts by DJ Thumbprint and DJ Norm Rocwell.